You may have taken a trip on the Pacific Surfliner, but have you ever tried riding in Business Class? Treat yourself to an upgraded experience with a few extra perks. The Pacific Surfliner unreserved Coach seats are already spacious, but most Business Class cars have even more legroom so you can really stretch and relax. Even better, Business Class riders are guaranteed a seat, which is helpful especially on busy trains which could be standing room only during parts of the trip. And because it’s located at one end of the train, there tends to be less foot-traffic in Business Class, resulting in a more private atmosphere. We have a great Café Car with fresh food, craft beers, cocktails and more available for purchase. In the Business Class car, riders can also enjoy complimentary snacks and drinks. Each morning, there is coffee, tea, water and juice, as well as pastries from a local bakery. In the afternoons, riders receive a snack pack as well as a soft drink or glass of wine! Our new snack pack comes in a nice box, with snack such as chips, cookies, cheese, gourmet olives and more. Business Class also has a dedicated attendant on most trains, who can answer questions and assist with luggage. There are also free newspapers, and just like the rest of the train, free Wi-Fi. The perks of Business Class extend beyond the train, starting at the moment you book your trip. Amtrak Guest Rewards members (who earn points with each Amtrak trip they take), get a 25% qualifying point bonus when booking in Business Class. Create an account and start collecting points for a free trip or other rewards. Not only that, but Business Class passengers starting or ending in Los Angeles get special access to the Amtrak Metropolitan Lounge, located at the station on the second floor. It has complimentary coffee, tea, soft drinks and snacks. Relax on the comfy sofas, watch some TV, read a newspaper or use the free Wi-Fi! Previous Post: More Service Between San Diego and Los Angeles! Hi. We are planning a trip from LA to Santa Barbara with our baby. Is a stroller with the infant seat allowed as our carry on item? Would we be allowed to bring a backpack and purse amongst 2 of us? Also, which side should we sit on to have ocean views? Is it expected to be quite busy tomorrow? Thanks! Sorry for the delay in seeing this message… I think you’re already on your trip, but yes, you can carry on the stroller and infant seat, as well as a backpack and purse. There are larger luggage racks downstairs in most cars (except the cafe car) as well as overhead racks upstairs and spaces for larger bags at the ends of each car upstairs. Hope you enjoyed the ocean views! Hi Art, from the Camarillo Station, the Business Class car would be the last car of the train. When you booked your ticket, did you indicate that your wife is traveling with a disability? We have accessible space/seats on train and you can request assistance. You can also call the 800 number to modify the reservation if needed. Please let us know if you have any other questions. The Pacific Surfliner travels as far north as San Luis Obispo. However, you could board the Coast Starlight, one of Amtrak’s long-distance trains, and ride to Oregon or Washington. Its last stop is Seattle. You can visit Amtrak’s website to learn more! My elderly (87 and 77) parents plan to ride the Surfliner 763 from Burbank to San Luis Obispo on November 22, 2017, the day before Thanksgiving. 1) If it turns out to be needed could there be assistance lifting their luggage (total of two up-to-50lb pieces and a standard airline carry-on) onto the train? 2) Can they reasonably expect to have seating? 3) Can they reasonably expect to have lower level seating? 4) Should they choose business class to be assured of having seating? 5) Where do we find business class rates and availability? 6) How does one book business class? Hi Stan, reservations will be required to ride Pacific Surfliner trains between November 22 and November 26, 2017 due to increased travel demand during the week of Thanksgiving. We’ve implemented this policy to avoid standing room only conditions, so there shouldn’t be a problem getting a seat. Lower level seating is reserved for travelers with disabilities, which is indicated during the booking process. This includes having reduced mobility like having trouble walking up stairs. When booking a ticket, you can indicate that one or both of your parents is traveling with a disability, which will provide a discount on tickets and also prompt a series of questions asking what type of assistance they will need, such as help with steps, luggage, etc. Business Class would still be a great option for your parents because there is a dedicated Business Class attendant (who can provide extra assistance with luggage, etc. ), free snacks and drinks, and a few other perks. Between Burbank and San Luis Obispo, it’s $21 extra per ticket to upgrade to Business Class. As a side note, the Burbank Station is not staffed, so if you’d prefer to have them board at the next station north, which is Van Nuys, there is a ticket office with an Amtrak agent who can assist them before the train arrives. The easiest thing to do would be to visit our website to browse the ticket options (regular vs. premium/Business Class) and book a ticket, but you can also call the 800 number to speak with an agent. Please let us know if you have any other questions! Hi Fran, seats aren’t assigned, but with a Business Class ticket, you will be guaranteed a seat in Business Class, which is at the front of the train for travel from Anaheim to San Diego. Thanks so much for the info! Sorry for the delay in responding to you, Darleen, we missed your question! From the Anaheim Station, you can actually show your Pacific Surfliner ticket to board an Anaheim Resort Transportation bus for free. It’s about a 15- to 20-minute ride from the train station to the resort. This article has more information: https://blog.pacificsurfliner.com/2018/02/14/magical-adventure-to-anaheim/ Check out our special promo as well! What time does the afternoon service of beer, wine etc begin ? Around noonish. Only receive on small bottle of white or red wine then have,to go to cafe car and buy it if want more. What’s the best station to get off at in San Diego to get to la jolla from? If we book a business class ticket from LA to San Diego but end up stuck in traffic and miss the designated time, will we automatically be placed on the next available train? Does purchasing a Business Class Seat guarantee a seat on the upper deck? I have a senior citizen who has riding a train on the upper deck on his bucket list but I can’t see anywhere where he would be guaranteed an upper deck seat? Please advise how it can be guaranteed. Hi Carina, lower level seating is reserved for passengers with disabilities, so with a Business Class ticket, riders generally sit on the second level. Let us know if you have any questions! Hi, I want to go from Olympia WA to Disneyland and I suffer from extreme motion sickness, what do you recommend I do? I know I should sit facing forward but unsure if upper or lower deck is preferred and if front or back of train matters. Would I be better if I got a sleeper? If I got a sleeper would I be confined to it the entire trip? Hi Christine, sorry for the delay in responding to you. It might be best if you contact Amtrak at 800-USA-RAIL (press 0 to speak with a representative) since you are traveling on a long-distance train for most of your trip. They’d be able to help with your questions about a sleeper car. 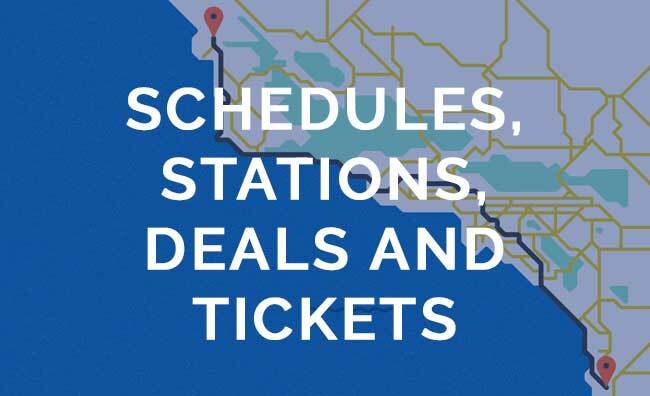 Our route (the Pacific Surfliner) would only cover a small portion of your trip, and we don’t have sleeper cars. You are right, sitting forward facing will help with the motion sickness. The lower deck is reserved for passengers with disabilities. We do have seats facing both ways, so you shouldn’t have a problem finding a forward-facing seat. Let us know if you have any other questions about the Pacific Surfliner! The Business class car will be the first car behind the locomotive. Which station are you boarding at? Hi Karen, So sorry for the delayed response. The Business class car will be the car directly behind the locomotive. Traveling southbound at Chatsworth, the locomotive will be at the rear of the train, so it will be the car furthest on the north end on the train. Chatsworth is an unstaffed station, but the business class attendant can help her load her bag. There is seating on the upper and lower level. She is able to request a lower level seat when booking if it is difficult for her to climb the stairs. Hi There! I have a Reserved Business Class ticket leaving from the Old Town (San Diego) Station. What car should I expect to board? Thanks! Hi Kaitlin, The Business class car will be the first car behind the locomotive. If you’re traveling northbound, it will be the last passenger car on the south end of the train (closest to downtown San Diego). Have a great trip! Take the Pacific Surfliner and save on Disneyland® Resort Theme Park Admission!